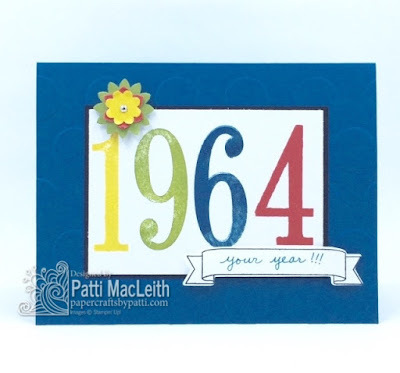 Papercrafts by Patti: What a Year! My sister was born in 1964. I remember when my parents brought her home. I was so excited! She was born the night the Beatles made their US television premiere on the Ed Sullivan Show. The doctors and nurses were very busy trying to catch a glimpse of the show, but unfortunately missed most of it because that is when my sister chose to enter the world! 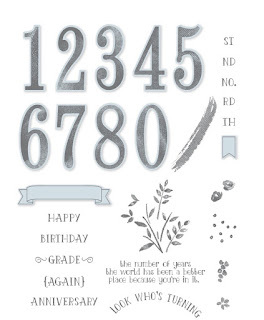 I made this card for her birthday this year using the Number of Years photopolymer stamp set. I love this set! It's going to be so much fun using the numbers for custom cards. Now we need a set of letters just as big with framelits to match! I used the banner from the same set to write my own message, but the stamp set comes with plenty of words to put into the banner if you choose. Whisper White card stock rectangle: stamp numbers using Crushed Curry, Old Olive, Island Indigo and Watermelon Wonder Classic Stampin' Pads. Cut Basic Black card stock to matt Whisper White piece. Add Boho Blossoms flower using matching card stock scraps. Adhere using Stampin' Dimensionals. Stamp banner using Basic Black ink. Write or stamp your greeting inside the banner. Adhere banner using Stampin' Dimensionals. Adhere rectangle to the center of the card base. Make recipient smile when you give this card! Thank you for visiting my blog today! I hope you enjoyed my card. Shop my Online Store any time. I appreciate your business--it keeps me in cards! Patti, this is great to use the numbers for the birth year! I love the idea and love your card.